Our Spirits articles always conclude by listing a few cigars we think would pair well with the spirit in question. StogieGuys.com is, after all, a cigar-focused website. 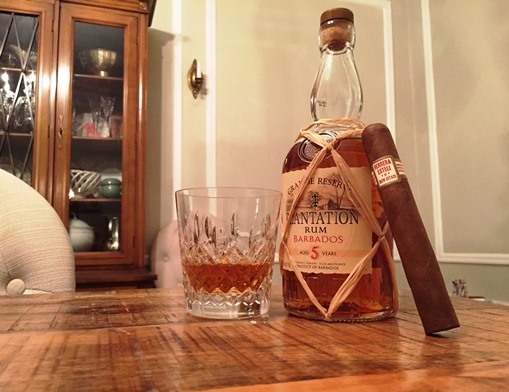 While having a recommended cigar pairing on its website is unique and somewhat helpful, that isn’t what drew me to Plantation Barbados Grande Reserve 5 in the first place. Rather, I was intrigued by the rum’s reputation as a low-cost sipping spirit that packs a ton of value and flavor into an inexpensive bottle. I paid just over $20 for a 750 ml. bottle (compared with Plantation’s flagship rum, XO 20th Anniversary, which is $45). Each vintage is named for its locale of origin: Grenada, Guyana, Jamaica, Nicaragua, Panama, Trinidad, and St. Lucia. The 80-proof Grande Reserve 5 is a blend of rums from Barbados that’s aged for five years in bourbon casks in the Caribbean then refined in old French oak casks at Château de Bonbonnet in France. It is presented in a stout bottle covered in a decorative netting made from palm fibers. In the bottle and glass the rum has a light, honey-colored tint with good clarity. The nose is easy on alcohol and heavy on fruit with hints of banana, coconut, papaya, and tangerine. Butterscotch, vanilla, and caramel are also present. Once sipped, the balanced, well-rounded flavor coats the palate with banana, toffee, orange, vanilla, and nuts. The finish has a prolonged, somewhat earthy spice. Is this one of the finest rums in the world? No. But it might be one of the best values. The taste, presentation, and complexity are far superior than what the price and young age suggest. That means you can use Plantation Barbados Grande Reserve 5 in cocktails guilt-free, and you can also sip it neat. I prefer the latter. As for cigar pairings, take Plantation’s advice and stick with mild- to medium-bodied smokes wrapped in Connecticut shade or Ecuadorian wrappers. Anything bolder will only overpower the spirit. I’ve found the Herrera Estelí Toro Especial works well.